Assini village and Ancient Assini | Gourmet Concoctions in Assini, Kopiaste! Assini or Asine, or Asini (Ασίνη) is a village in the prefecture of Argolida, belonging to the Municipality of Assini, (which includes the villages of Assini, Tolo, Iria, Drepano and Karnazeika). It is 8 km away from the town of Nafplion and 2 km before Ancient Assini. According to the census of 2001 the municipality has 6000 inhabitants, out of which (according to the census of 2001), 1.064 inhabitants live in Assini. During the Ottoman occupation of Greece, the village was called Jefferaga, named after the Ottoman commander of the region whose name was Tzeffer Aga. In 1902, it was renamed to Assini again. The main road of the village, is called Ancient Assini road straight ahead ends in Ancient Assini. Just before the school and turning left, the road goes to Drepano but if you go straight ahead, after the round-about, if you take the road to the right you reach Tolo. The population is mainly rural, cultivating citrus groves (oranges and tangerines), olives, vegetables, mostly artichokes in Iria and also people have fishing as their occupation as well as summer sea sports. The past years the village being not far away from the sea and the most tourist developed resort of Tolo, has also developed tourist facilities as well. Before reaching the village, 500 metres on the foothill of Profitis Elias, is the settlement of Aghia Paraskevi, with about 200 inhabitants enjoying a wonderful view of the plain around it. Profitis (profet) Elias takes its name from the small chapel on the top of the egg-shaped mountain. The mountain is lit during the evening offering a spectacular view. If you would like to go to the top of the mountain see my post for instructions how to get there. 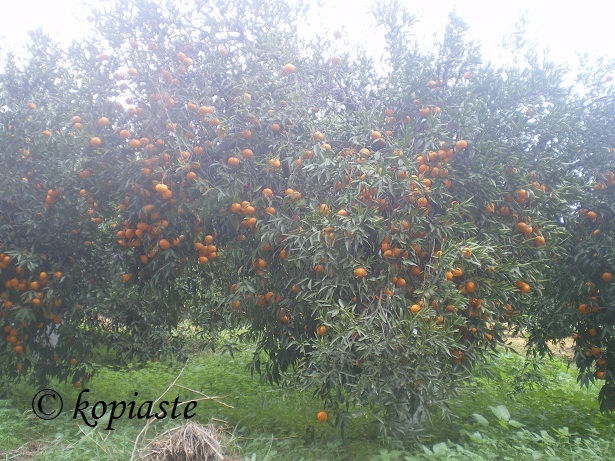 In our village Assini, the majority of it’s produce are mandarins, less oranges, bergamots, pomegranates, olives and vegetables. There are a few varieties of mandarins such as clementins or nova but those with the most juice and flavour is a unique local cultivar called “the common mandarin” with pips in it which is amazing in taste. Visiting during the months of April and May, you will have an amazing experience seeing all the citrus trees in full bloom and the wonderful aroma the air is filled in with millions of bees taking the nectar from the trees, where the farmers produce the local honey with citrus flavour. The Acropolis of ancient Assini (or Asine), today known as Kastraki is a rocky peninsula by a natural harbour in the Gulf of Argolis, near the town of Tolo. The promontory is 52 m above sea level; it is 330 m long and 150 m wide. Some have linked the silhouette of the rock to a ship with full sails. According to Homer, Assini together with other Argive poleis (city states), such as Argos, Tyrinth and Epidavros, took part in the Trojan War with a fleet that consisted of 80 ships and was led by King Diomedes. The earliest traces of settlement on the Acropolis are from the Neolithic period (5th millennium b.C.). The site was subsequently settled during the Early Bronze Age (2600 – 1900 b.C. ), during the Middle Bronze Age (1900 – 1550), during the Late Bronze Age (1550 – 1050 b.C.) and again during the historical period to 600 A.D. The fortification walls around the Acropolis can be dated to 300 b.C. They were most likely built by Demetrios Poliorcetes, during his time as King of Macedonia. The main entrance lies in the north, with a side entrance in the east. The Great Bastion on the eastern side of the circuit wall, as well as two smaller towers on the acropolis, was built to resist catapults and other siege machines. The fortifications were added on to at least during the Byzantine (6th – 7th century A.D.) and the second Venetian (1686 – 1715) periods. During the Italian occupation in World War Two (1941 – 1943) trenches and other defense works were constructed on the Acropolis. Archaeological excavations were conducted by Swedish Archaeologists between 1922 and 1930 in the main settlement on the Acropolis, in the Lower Town and on the Barbouna Hill. From the 1970s onwards, excavations were resumed by the Swedish Institute at Athens and by the 4th Ephorate of Prehistoric and Classical Antiquities at Nafplion. A ship wreck of the late Mycenaean period 1200 b.C., carrying cargo from both Crete and Cyprus was located near Cape Iria 14 km to the southeast of Assini at a depth of 28 m. The findings of the wreck such as pots, amphorae, ceramics, a stone anchor etc., are exhibited at the Museum of Spetses. A terracotta head of the same period, known as the “Lord of Assini”, gave its name to a poem by the Nobel laureate G. Seferis. It was found in a cult room in one of the Late Bronze Age houses in the Lower Town and can be dated to 1200 – 1100 b.C. Assini flourished again in early historical times, in the 8th century b.C (Late Geometric period). At this time the town had contacts with Athens, as well as the Cyclades and the southern Peloponnese. According to Pausanias, Assini was destroyed by neighbouring Argos, most likely around 700 b.C., as it had taken Sparta’s side in a war between those city states. The inhabitants were forcibly moved to the Assini of Messenia (today’s Koroni). The settlement at Assini decline for a couple of centuries but the site was never abandoned completely. An Archaic shrine to Apollo (7th – 6th century b.C.) has been located on the top of the Barbouna Hill. However, there are no extant remains. Houses from the Hellenistic period (3rd – 1st century b.C.) have been found as well as cisterns and olive presses both on the Acropolis and in the Lower Town. Hellenistic burials have also been found in the neighbourhood. The settlement at Assini continued into Roman times. Ruins of baths from this period (5th – 7th century A.D. can be seen in the Lower Town next to the picturesque chapel of Panaghia. The findings from the excavations at Assini are mainly kept in the Nafplion Archaeological Museum. Some of the findings from the excavations of the 1920s are now in Sweden in accordance with an agreement between the Assini Committee of the 1920s and the then Greek Government. (Source: Information board on site). At the Western side of the Promontory a small bay with organized facilities and a taverna. As a local I’ve visited ancient Assini many times in the past. At the time it was impossible to go further than a few metres (52 metres high) to the top as it was very steep and difficult to go walk up there. Apart from a sign at the bottom stating a few things about it’s history and a few ruins and the walls there was nothing much to see. After the restoration of the site, wonderful paths and steps have been added making the climb up very easy. Before going up though you should definitely watch the video which is about 20 minutes showing the history of this site starting from 5000 b,C., the archaic settlement (Hellenistic period) dated from the 3rd century b.C,, to the Roman period, Byzantine period and Venetian occupation. The site was partly destructed by the Italians, during WWII by making repairs on the ancients walls and site by adding fortifications, trenches, small buildings, staircases, observation points etc., using material from the settlement. The archaeological dig during early 20th century revealed many artifacts, which are now in the Museum of Nafplion and the recent restoration highlights the ancient baths, old winery, cisterns, etc. The view is amazing as you can see the beach of Plaka Drepanou on the East, the town of Tolo on the west and on the north the village of Assini with the citrus trees and the hill of Profitis Elias. On the south is the sea and on a clear day you can see the nearby islands. To get an idea of walls you have to walk outside the archaeological site to the western side of the site towards the beach of Plaka.